Saturn represents restriction, limits and teaches the lesson of time. Saturn deserves its reputation as the most feared planet because it is relentless in forcing us to learn the lessons of the house in which it falls in a natal chart. There's no escaping it. Restriction, fear, hardship, and limitation are always found where Saturn is teaching lessons. It never gives an easy way out and it takes its time. Years are spent dealing with the difficulties this planet presents, but with time, the planet does reward the chart holder with wisdom, confidence and patience. There's no point in fighting against the forces of Saturn because it uses time and experience to teach. Acceptance and the courage to develop patience are the best recourses in a struggle with Saturn. the sign and house of your Saturn. Self-doubt can be a powerful feeling where Saturn is found in a natal chart because the planet has high expectations. It expects concrete results and it has the patience to wait for them. There is no room for error. If a task is done in a house where Saturn is found in a natal chart, the chart holder will feel a strong need to do it correctly and by-the-book. Saturn wants us to follow rules and even do things the old-fashioned way. It wants structure and it believes that rules which authorities declare to be correct are the only valid rules. This is a great deal of pressure for the chart holder which often results in self-doubt. Saturn takes life seriously. Where Saturn is found in a natal chart there is be pressure to follow rules. Structure is imposed and authority figures are prominent. A person's reaction to these factors will vary. Some people choose to accept it and follow the structure and rules in the serious manner Saturn prefers. Others rebel and fight against them. There are also those who flee. It isn't always pleasant, but Saturn will teach the lesson of authority, structure and rules regardless of the chart holder's reaction to them. Over time, Saturn's lessons will be learned. The house where Saturn falls in a chart will eventually be mastered. The planet rewards the chart holder with its wisdom about hard work, restriction, limitation, struggle, and patience by teaching the lesson of time. Later in life, after many Saturn oppositions and returns, people finally appreciate the wisdom that Saturn has given them throughout their lives. Whether they dealt with Saturn by fighting it or waiting it out, the result is the same. All of the resistance, struggle and hard work that Saturn brought were conquered when we let time mature us into people who are able to overcome it. In old age, whether or not we choose the accept the lesson or not, we all understand it. We reap what we sow. Every debt is paid and every success is rewarded. Running away from struggles with Saturn in your natal chart won't bring you freedom from its painful ways. It will only delay the inevitable because Saturn actually uses time as one of its tools in teaching. Saturn is a wise, mature planet. It knows that time is the best teacher. But it actually works to our benefit. 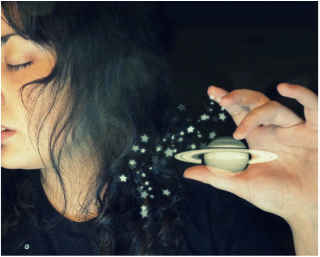 Even if you do spend years running away from those feelings of restriction, limitation and self-doubt that Saturn imposes on us, Saturn is still doing its job. Saturn knows that regardless of how much time a person spends running away from it, time will still teach the lesson. This actually makes it easy for us. We don't have to stick around and constantly fight. Saturn is a patient planet. It will wait for you to learn in your own time.